Margaret Hardy or Paul Hardy. or us both together. 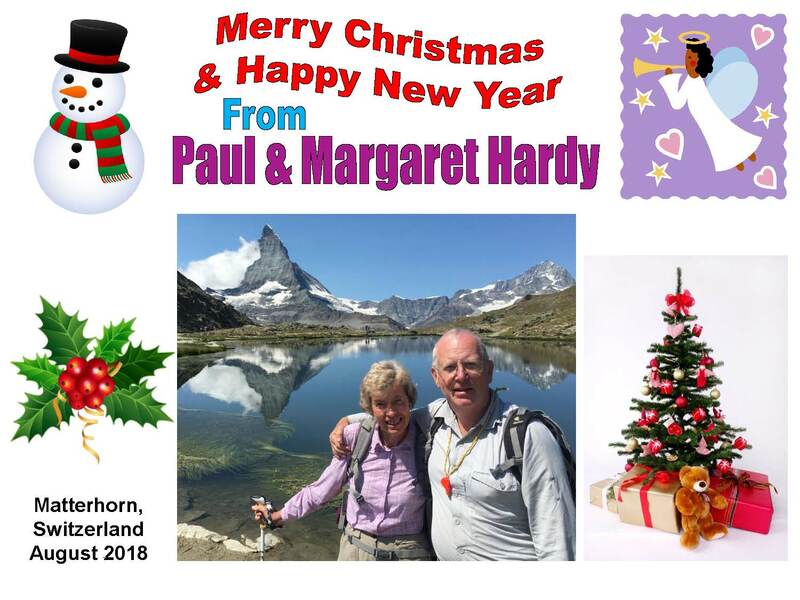 Look in Paul's page or Margaret's page for further pages on our interests and activities. Click for information on the village of Comberton where we have lived since 1976 (apart from 2004-2006). Here also are location maps, a free map of the village, and directions for finding our house. There is some information there on our twinning with the village of Le Vaudreuil in France, but there is more on my Twinning page. While talking about Comberton, why not read about the local Comberton Ramblers and come for a walk? Or read about the local badminton shuttles club and come along and play? Paul has a page on his Lachenal, Wheatstone, and Case concertinas, complete with pictures.and some recordings of his playing. He also hosts a page on Greenshoots - a local music practice group. Paul has published Paul Hardy's Session Tunebook, and Paul Hardy's Xmas Tunebook with hundreds of traditional tunes for download, printing, ordering in hardcopy, or using in computer music programs. Paul worked at Laser-Scan for 28 years and has pages on the history of this world-beating British technology company. Although not a trained cartographer (for 40 years he was a toolsmith to the mapping industry), Paul has created various maps. See our Christmas 2018 Annual Letter for a review of the year, or look in the page about us together for summaries of the last few years. If you didn't get a card from us then here is a 2018 Christmas card for you! If you came here looking for Paul Hardy's consultancy and contract services, or Hardy Systems (www.hardy-systems.co.uk), or Location-Services (www.location-services.co.uk) then you are in the right place, but they are dormant - see the Hardy Systems homepage. Click for information on the city of Redlands, California, where we were exiled from the end of December 2003 to end of December 2006. A map to show where visitors come from. If you want www.paulhardy.net, that too points to here for the present. The archive and picture material which was at http://www.hardyarchive.com/ has moved to the archive section of this site. Here is a temporary folder for transfering documents. Finally, here are some resources for TEFL (Teaching English as a Foreign Language). This is the hardyfamily version of pghardy.net. To send me an email message, use paul at paulhardy dot net.